There are so many kinds of history—social, economic, political, art—but what I want to explore is literally material history: a sweater’s history. I firmly believe that things—in this case, sweaters—have lives that evolve and that their experiences leave legible traces. Their real meaning changes along with them as they lead valued lives. 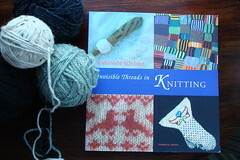 This particular excursion is inspired by a book I bought last weekend: Annemor Sundbø’s Invisible Threads in Knitting (translated into English by Carol Huebscher Rhoades). It is itself a history—a charming history of Norwegian knitting and cultural traditions—but it also explores garments and their individual histories. Sundbø owned a wool recycling factory in Norway, and saved countless mittens, socks and sweaters from the shredding machine. 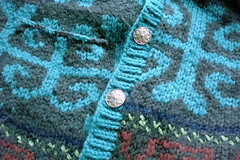 Each piece of knitting had been made lovingly by hand, then re-fashioned into new garments. Socks and sweaters that had begun to unravel were re-made into mittens, slippers, even underwear, and when they finally reached the end of their useful lives, were consigned to the wool stripper to become shoddy, and to be made into batting for comforters. Somehow, it’s easier to let go of a machine-made sweater than it is to give away a handmade one (particularly when you know or are the person who made it!). We live in a society that discards useful things quite readily; which I suppose makes those things made by our friends’ and our own hands seem so much more valuable. It’s nice to know that something useful can be treasured and renewed in this purge-happy culture. It seems rather important to hold onto the belief that something made by hand should not be jettisoned. I suppose I’ve always believed that the lives of objects are not static. One of my favorite stories as a child was Hans Christian Andersen’s fairy tale, “The Steadfast Tin Soldier,” (1838), in which a tin soldier falls from a window; is discovered in the street, placed in a paper boat and set afloat; finds himself in a gutter; is swallowed by a fish; returns home inside the fish and is rediscovered by the family cook; is summarily cast into a fire, where he melts alongside his paper ballerina love; together they form the shape of a heart. A translation can be found here. Very poignant, and probably much more sophisticated than my young mind was able to appreciate, but I so sympathized with the soldier; I had no trouble at all imagining him as animate. 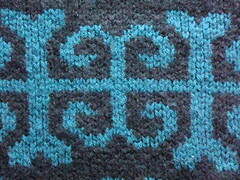 So now I want to explore the life of one of my early knitting attempts, and consider what new life it might now assume. My first attempt at color knitting was a Kaffee Fassett pattern, which I was seriously under-equipped to master, but having supreme confidence and not knowing any better, I dove in headlong. I had fallen in love with the yarn on a trip to England and this seemed like a great way to showcase it. 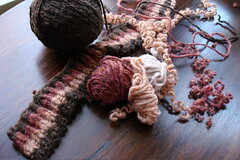 It was a mess: I ran out of that lovely yarn; the sweater was thick enough to insulate a house; the wrong side looked like a child’s pot holder. I could never have worn it. So I cut it up and made it into pillows. I still have a bit left (see above), which I think will make a nice felted tea cozy. But that’s not the sweater I want to explore. It was—is—Annabel Fox’s pattern, Mosaic Cardigan, which I believe was published by Rowan around 1990, and it was my next attempt at color knitting. But the important point for this story is that it was a pattern I had chosen for myself. I had scraped together the money to buy the yarn (not easy for a grad student! ), and really looked forward to wearing it. 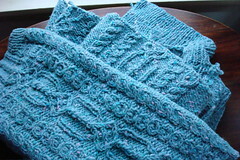 When I finished knitting the pieces, it was enormous; looked more like a huge sack than a cardigan. It was more or less the right length, but my gauge had been tremendously loose and produced a very wide overcoat. Still, I loved the design motif and colors and even found the perfect pewter buttons. Since I am a complete failure when it comes to sewing, my dear sister-in-law agreed to help me cut the cardigan down to a smaller size and stitch the pieces together on a machine. 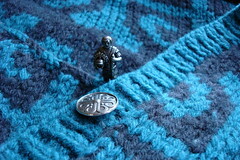 This operation was quite effective and although the cardigan was still roomy, it was certainly wearable. About two minutes after I had decided that I could really enjoy wearing this imperfect sweater, my father came along and admired it. Then he tried it on. Not only did it fit him perfectly, it looked great on him. Really great. His silver hair really set off the colors and he clearly loved it. How could I refuse him? I didn’t. It was clear that the cardigan had found its right home. He wore it all the time, and took great pleasure in it. When he died a few years later, my mother gave it back to me, quite holey and its pockets full of cookie crumbs. I haven’t been able to bring myself to wear it, but I love thinking about how happy it made us both. I think the time has now come to give it a new life. So I’m taking a lesson from Annemor’s book and am contemplating its new life: pillows again, I think, or some kind of a lap rug. It needs to be a more visible feature of my daily life. And I don’t want to wear it because it was his. And I don’t want to felt it because I want to recognize it as his. 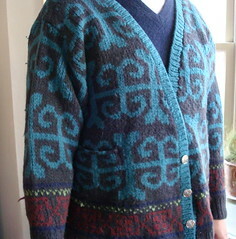 I looked long & hard on the web to find traces of Annabel Fox’s mosaic cardigan pattern, and discovered that someone else had blogged about it, and had similar plans to “re-purpose” it. Review of the book from the store where I bought it. Apparently, Invisible Threads won a major Norwegian literature prize in 2006. Sundbø, Annemor. 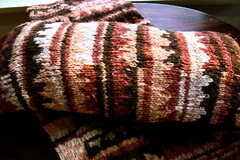 Setesdal Sweaters: The History of the Norwegian Lice Pattern (Kristiansand : Torridal Tweed, 2001). Translated by Amy Lightfoot. Sundbø, Annemor. 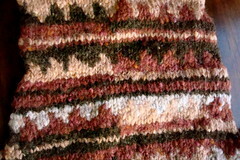 Everyday Knitting: Treasures from a Rag Pile (Kristiansand : Torridal Tweed, 2000). Translated by Amy Lightfoot. Judy Furlong, “Knits Unravelled: Reuse, Recycle or Re-knit?” a guide, in Knitting Magazine (Issue 48, March 2008): 32-35.